The answer is interesting. 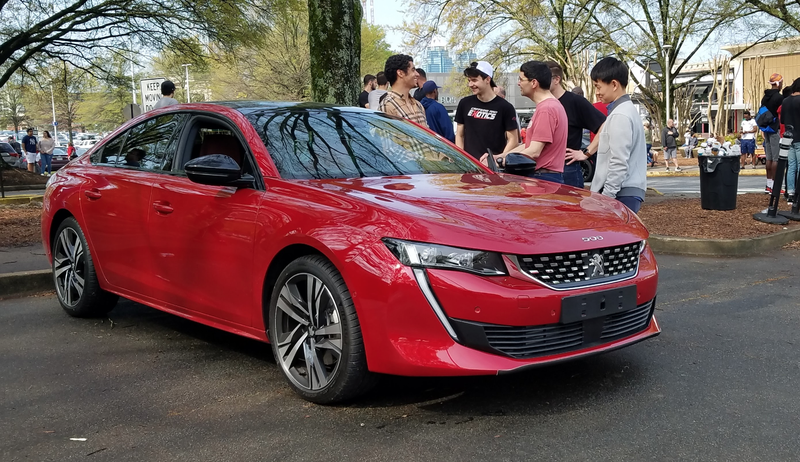 The cars were brought by representatives from Groupe PSA, the parent company of Peugeot, Citroën, and Vauxhall, a company that is planning a return to the U.S. market, and who has selected Atlanta as their regional headquarters base, which explains why the car was shown there. The Peugeot brand, while completely unfamiliar to most Americans except for vague memories of that one weird uncle who taught some independent study thing at some small college in the woods and his brown Peugeot 504 wagon, should be well-positioned to be re-introduced by cars like this 508GT. Peugeots have almost always been stylish cars, and this new 508 isn’t any different. It’s a handsome sedan, modern and sleek, but just different enough to not be confused with anything from Germany or Japan. Peugeots have always had French charm but less Gallic quirkiness than Citroëns, which I suppose would make them a safer bet to attempt to re-enter the American market. This 508GT is a fairly new design, debuting last year, and makes around 225 HP (222 bhp) from its turbocharged 1.6-liter four. That’s not bad! The exterior styling is excellent, and I think is especially strong from the rear, where the full-width black bar enclosing the triple-slash taillights gives the whole car an especially athletic air. It sort of reminds me of what the rear of a well-executed Mustang four-door sedan could have looked like, just with a lion instead of a horse hanging out back there. As far as how PSA plans to position the car, or how much they want to sell it for, we can only guess. Translated into real American money, the 508GT would be around $32,000, which seems pretty reasonable, and would be competitive with cars like Volkswagen’s Jetta GLI. If I had to guess, I’d think Peugeot could position themselves somewhere just above VW and just below Audi; possibly even as an option to more overtly premium cars like BMW or Alfa Romeo, since the brand, being relatively unknown in America, could maintain some degree of perceived exclusivity and exoticism that brands like Volkswagen or Kia or Honda or Volvo lack. I’m very curious to see how this all pans out, but, regardless, I’m delighted we’re going to have French cars for sale in America once again.